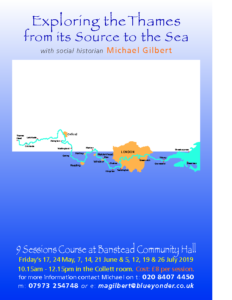 These Lectures by social historian Michael Gilbert will be held in the Collett Room (the room in the centre next to the kitchen), in the Banstead Community Hall. Park Road, Banstead SM7 3AJ. Please arrive for 10am, the lecture will start at 10.15am, with a refreshment break at 11am for 15 minutes, finish at 12.15pm. The cost will be £8 per lecture – £72 for the 9 lectures. A Pack of Notes, Maps & Illustrations for each lecture will cost £12 for the whole series. One or more walks will also be arranged, dates to be arranged, at a cost of £8 per person.